Poor Slovakia. It is a beautiful country, with some of the best roads and landscapes I have seen on this trip, but it only gets a few lines and some pictures that do not do it any justice at all. Our next stop was Budapest, which meant that we were going to cross Slovakia from north to south to get there but we would not spend a night in the country, so everything we saw was from the road. It made a great impression, the road was really enjoyable and there was very little traffic, so we had a great time riding through it. Also, I would like to congratulate the driver of a dark gray Suzuki Gran Vitara for his excellent driving manners. I was going to say ’99.9% of drivers…’ and most people who know me would think I am exaggerating, as I usually do, but if you take into account that I have been driving or riding for 15 years and have only seen two drivers behave like this, maybe even 99.9% is too low a figure. Anyway, 99.9% of drivers can drive fast on a straight line, any idiot can drive a modern car fast in straight line – they just have to put their foot down and the car goes, not much more to it. However, the moment they see a corner approaching, they slow down to an irritating crawl, apparently thinking that their 60.000-thousand euro Audis equipped with a whole alphabet of safety acronyms are going to suddenly decide to fly off the road and send them and their beloved families through the gates of hell engulfed in a fire ball if they take the corner at anything other than walking pace. These are the most annoying people you can find on the road, as you are trapped behind them, suffering their total lack of driving skills, but the moment the road becomes straight and you have a chance to overtake them, the very limited part of their brains related to driving that controls their right foot makes the connection ‘straight line – safe’ and they floor it and disappear until they find the next corner. There is an extremely rare type of driver, however, that is aware that there are other people using the road, people who might want to travel faster than them on corners, and who tries to be as little of an annoyance as possible, This driver will go around corners at a reasonable speed in order not to make much of a nuisance of himself, but come a straight bit of road, he will slow down to let you pass. So thanks very much whoever was driving that Suzuki, and if there were more drivers like you in the world, the roads would be a much nicer place. We stopped a few times in Slovakia for petrol, some food, an ice-cream, the country sticker, etc. and made it to Budapest in the early evening. We went back to that wonderful place that is BikerCamp, and before putting up the tent or even thinking about doing some shopping for dinner, I had a shower and we sat down to chat with some Italian bikers and enjoy a few beers. Unfortunately, this meant that by the time we thought about the shopping, the supermarket was closed, so we had to go to one of those 24h grocery stores that always seem to have a few dodgy characters at the door drinking beer 24/7. Once we had filled the basket and were going to pay, they told us that they did not accept credit cards, and we did not have any local currency, so we had to leave the food there, find an ATM and then go back, all with an empty stomach and five beers affecting our reasoning ability. In the end we managed to cook a meal that properly restored our energy (bacon, lots of bacon), and then went back to the beer and the interesting conversation. 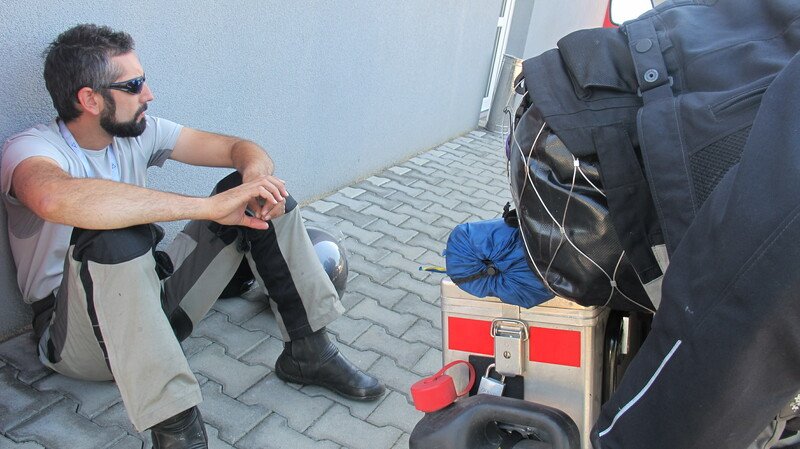 This entry was posted in Stroming The World 2013, Travel and tagged Biker Camp, Budapest, Slovakia, STW 2013 by Kilian. Bookmark the permalink.